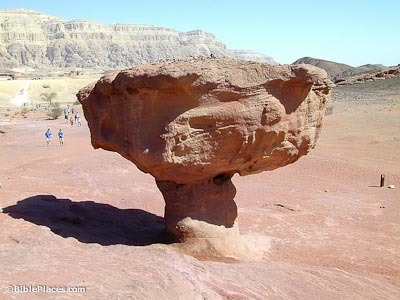 The Timna Valley is located 15 miles (25 km) north of Eilat (Elath). 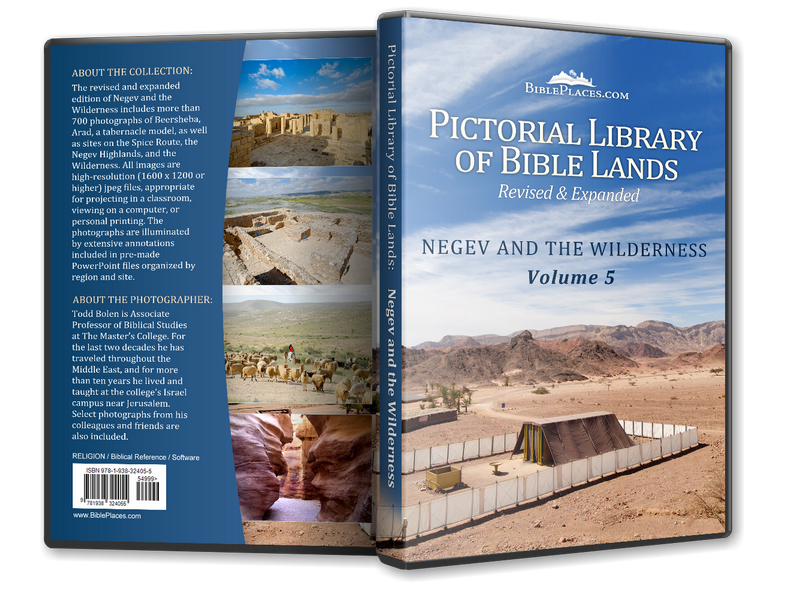 It is not mentioned in the Bible but was used for copper mining during the biblical period. (The Timnah in Judges 14 is located further north.) 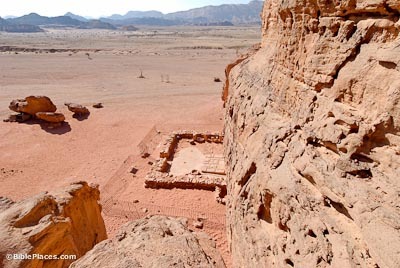 The valley of Timna is 35 square miles (90 sq km) with high mountains (1600-2300 ft; 500-700 m) on all sides except in the east. 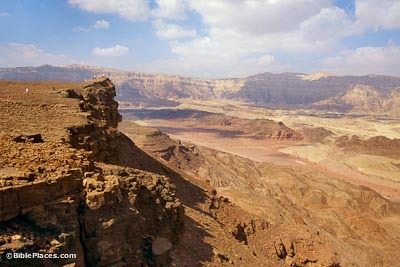 Mount Timna in the center rises 1486 feet (453 m) above the surrounding valley. The valley is drained by four wadis. This unique geological formation was once part of the adjacent mountain. It was formed by erosion caused by winds and rainstorms. The layers of rock in the area consist predominately of sandstone but also contains dolomite, lime, and marl. Copper was mined in this valley as early as the Chalcolithic period (c. 3500 B.C. 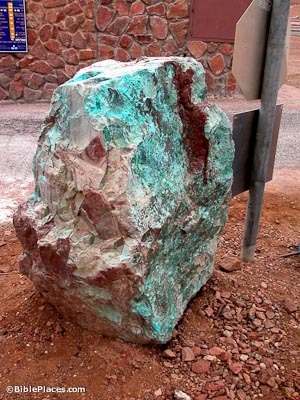 ), making them the oldest known copper mines in the world. An early explorer in this region, Nelson Glueck, believed that Solomon mined at Timna. Archaeological investigation after Glueck concluded that there was no mining activity during Solomon’s time. But the latest research concludes that the peak of production was during Solomon’s rule, perhaps by his Edomite subjects. Copper was mined here during the Chalcolithic, Early Bronze, Late Bronze-Iron II, and Roman periods. The copper ingots produced here were transported elsewhere to be made into tools. Copper was a very important metal in the ancient world because of its use in bronze. 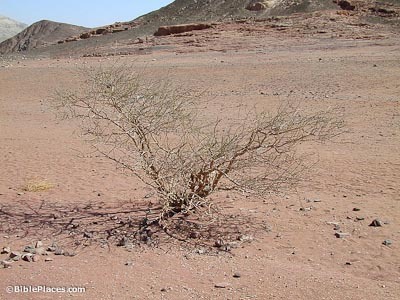 Over 10,000 mining shafts have been found in the Timna Valley. An Israeli company, Timna Copper Mines, Ltd., mined in this area until the price of copper decreased in the 1970s. References in the Bible to copper metal and mining include Deuteronomy 8:9, Job 28:2, Ezekiel 22:20, and Luke 21:2. Egyptian miners in the 13th century built a temple to the goddess Hathor against the face of Solomon’s Pillars. The excavators found hundreds of Egyptian objects including seals, jewelry, and art objects. The temple was rectangular, may have been covered with a fabric material, and had a niche for a deity figurine. Hathor was the Egyptian goddess of love, and served as the patron god of miners. Depictions of Hathor were found in the temple art and architecture. Solomon’s Pillars are natural geological formations that were formed when the rock cracked and water eroded them to separate the rock into distinct “pillars.” An inscription nearby depicts the Egyptian pharaoh Ramses III offering gifts to the goddess Hathor.